Our job growth forecast for 2018 greatly exceeded expectation, with roughly 65,000 jobs added to the Seattle metro area this year, not to mention the planned tech investment and development all within a limited geographic area and one of the prettiest cities in the nation; Seattle has been the nation’s fastest growing big city this decade. Moreover, we have the number one airline on the West Coast, Alaska Airlines, which is based in Seattle that will soon expand with commercial flights out of Paine Field in Everett beginning February 2019. “I understand,” she said. “But, what would you say to me if I was . . .” — I interrupted her with, “I’m planning to buy in one to five months.” She looked skeptical. So, what is my secret formula for timing the market? By being in it for the long term. We will be in this new house for five to seven years at a minimum or, it may serve as our primary residence for at least two years before we rent it out for no more than three years in order to qualify for the capital gains exclusion. The market may go up or down in the interim, but the long-term value of the home and land should appreciate as long as its well-maintained and improved upon over time. One of the best indications of what’s going to happen in the future is to look at what’s happened in the past. The following graph illustrates the value per square foot for the past decade. 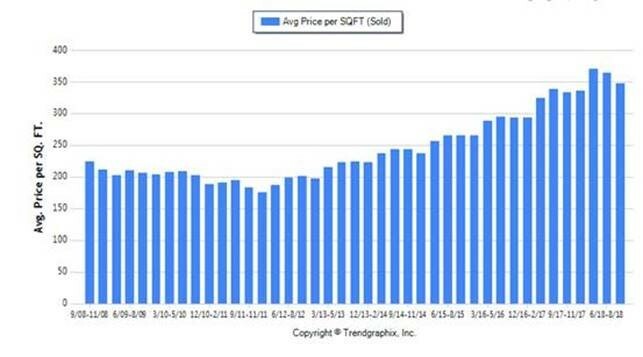 The average price per square foot for single-family homes in King County over the past ten years indicated quarterly. I believe there will be continued home price growth in 2019 that will be more moderate relative to the last several years of double-digit gains. I’ve experienced three housing markets in 2018: A White-Hot Seller’s Market (January-May 10th), Declining Market (May-mid October) and a Stabilizing/More Neutral Market (mid October to Present). I’ve seen more activity in December than I have in October and November combined. Recently, there has been an increase in sales and decrease in inventory and I believe there will be moderate home price growth in 2019 as inventory gains taper off. Single-family sales activity in Seattle. To be sure, inventory has risen dramatically on a year-over-year basis with a 41 percent increase from November 2017 to November 2018 (at 11,193 homes and condos to 15,830, respectively). In King County, gains were even larger, with a 135 percent year-over-year change—single-family home inventory doubled while condominium selection more than tripled. Months of inventory in all 23 counties surveyed and in King County was at 2.3 months, which is an improvement, but is also still below a balanced market. In areas where single-family home inventory has grown, home price appreciation has been restricted to the single digits, however in areas that are still tight for available homes, increases remain in the double digits. In all, market experts anticipate the more balanced market to continue through 2019, with inventory gains in the spring that will taper off toward the end of the year. Sustained job growth will continue and rising mortgage rates will have only a modest impact on buyers over the coming year. As previously mentioned, I’ve experienced three housing markets in 2018: A White-Hot Seller’s Market (January-May), Declining Market (May-October) and a Stabilizing/More Neutral Market (October to Present), which was primarily affected by the Federal Reserve increasing the Fed Funds Rate, which translated to higher Mortgage Interest Rates. The Federal Reserve has been raising rates for the last three years, in an effort to “normalize rates.” Keeping rates at near zero runs the risk of allowing inflation and the economy to run too hot. As we end 2018, the U.S. economy is on the longest expansion (winning streak) since WW2, and most experts agree that 2019 will see more expansion but at a slower rate. As the Federal Reserve raised rates aggressively in 2017 and 2018, it kept inflation around the target rate of 2 percent and kept the economy from overheating. In recent weeks, however, the Federal Reserve has changed its stance on raising rates in 2019 and will do so at a moderated pace. Most feel that rates have peaked and we will be much more stable into 2019, which will support home buying into the foreseeable future. In a market like Seattle, having a stable rate environment will help fuel Seattle as one of the top markets in the U.S. yet again. I do not see a way in which the value of homes in the Puget Sound region will decrease in the long term, especially as you consider job growth—which is estimated at 60,000 new jobs annually over the next 3.5 years—and critical infrastructure developments underway. On December 7th, Realogics Sotheby’s International Realty hosted their annual Momentum event, inviting a panel of experts from a range of industries to take the stage in a unique panel moderated by Marc Berger, vice president of Nyhus Communications. Among the esteemed panelists was Laura Kane, executive director of investment strategy for UBS Wealth Management; and Dylan Simon, executive vice president of Colliers International. Kane kicked things off with a macro-analysis of where our market is today and what we can expect as we shift into 2019. She touched on China relations, Federal Reserve rate hikes and general uncertainty among consumers as top considerations, but noted that growth is expected to remain healthy for the coming year. A highlight of Kane’s talk was her discussion of the rate that technology is transforming society. “Whereas it took twenty-five years for the television to become used in U.S. households, it only took seven years for the internet,” Kane said. We are moving much more quickly than we did in previous decades, which Kane said makes it tough to think about the long term. How can we know where we will be in the next ten, twenty, or thirty years? We can look to technology to play an integral role in alleviating the challenges of the future, particularly within enabling technologies, healthcare and Fintech (computer programs and other technology used to support or enable banking and financial services). Next, Simon took to the podium to discuss job growth in our region. As Simon outlined, the Seattle area added 65,000 jobs last year, which far outpaced any growth we have seen yet. Though the unemployment rate in the area is slightly higher than the national average—with Seattle at 4.3% and the nation at 3.7%—hourly earnings are significantly higher. Simon also touched on new development units, which totaled 55,000 from 2010 to 2017 and are projected above 100,000 into 2018 and beyond. Overall, the Puget Sound region — and specifically King County — has a very bright future for a prolonged period of time. The fundamental underpinnings of new jobs, and the wages those jobs will generate, top the nation. · Amazon now owns twice as much office space as it did in 2016 and will reportedly occupy 15 million square feet of office space throughout downtown Seattle with current commitments. · Apple is expanding within Two Union Square with more than 70,000 square feet to office 500 employees (rumors persist that it is making offers on larger office space). o Apple plans to open new Seattle facility and hire additional 1,000 employees as part of its expansion. · Google continues to expand in South Lake Union (with five buildings either under construction or in planning), comprising nearly 1 million square feet of office space with occupancy expected by early 2019 — the downtown Seattle campus could employ more than 4,500 people. · Facebook has opened a new campus at 1101 Westlake in addition to other leaseholds in South Lake Union with current capacity for 3,000 employees. The social media giant recently applied for permits for Oculus expansion of more than 60,000 square feet of office space in the Home Plate Center near Safeco Field in SODO. It’s presumed the company leased all 124,000 square feet of the available space, but is merely building out the first half at this time with future plans to grow into the remaining space. · F5 Networks has leased 516,000 square feet in a new office tower (now called F5 Tower) with an estimated 1,500 employees and room to expand. Excess office space is temporarily being sublet and attracting other employers. · Expedia plans to relocate its Bellevue headquarters to Interbay (Seattle waterfront) in 2019 in what may eventually comprise 1.9 million square feet of office space for approximately 8,000 employees (recent indications suggest the company will moderate its growth in measured phases). Many Bellevue-based employees will either relocate to Seattle or face an arduous commute. · WeWork Northwest continues to expand in the Seattle region and is eyeing a total of 2 million square feet of office space in the greater Seattle area with new commitments in the World Trade Center North building and a 36-story tower being developed in Belltown (this tenant is critical for future growth in tech as many startups are incubating in co-working environments). · Amazon occupies one office tower in Bellevue with 2,000 employees and plans for another with the potential of adding another 2,500 employees by 2020 — that’s about 10 percent of the regional headcount. · Vulcan Real Estate is planning 3 million square feet of office space — likely to target additional expansion of Amazon and other tech users. This developer is very close to the tech growth, and their commitment to Bellevue is a strong signal of additional tech expansion in the region. · Tableau Software has preleased 180,000 square feet of Kirkland Urban for occupancy in 2019. · Facebook will reportedly develop 650,000 square feet of office space in Redmond and along Willows Road for their Facebook Reality Labs/Oculus campus, according to public records. · Microsoft is doubling down on its campus rebirth with a multi-billion-dollar expansion that could office upwards of 8,000 employees. The direct connection to LINK light rail means Microsoft employees could choose to live in downtown Seattle or Bellevue and enjoy reasonable commutes to Redmond. · SRM is planning a 136,000 square foot building adjacent to Google’s Kirkland campus, likely for Google’s continued expansion. · Rumors persist about the expansion of Alibaba and other international tech companies seeking growth in the region (including potential leases at Southport on the Renton waterfront). · While not tech-oriented, Costco Wholesale recently announced plans to expand its Issaquah headquarters by 1.2 million square feet with room for 4,000 employees. Again, eventual LINK light rail service to Issaquah affords employees the option of living in an urban market and commuting by train to work. 50 Tech Companies in Seattle to Know 2019. Virtual Reality (VR) and Augmented Reality (AR) are still in their infancy as technologies, but are going to revolutionize how we interact with the world and create new industries; Seattle’s Silicon Forest will be one of these centers of innovation. In January 2018, the $6 million UW Reality Lab, funded with equal contributions from Facebook, Google and Huawei, created one of the world’s first academic centers dedicated to virtual and augmented reality. The new center in the Paul G. Allen School of Computer Science & Engineering and located in Seattle — a national hub of VR activity — will support research and education initiatives with potential to deliver game-changing breakthroughs in the field. The UW Reality Lab’s location in Seattle — one of the most active centers for VR and AR development — is paving the way for unique industry and academic collaborations aimed at achieving new capabilities and offering a seamless user experience. The largest hurdle for the global economy seems to be the business relationship with China. I believe a trade deal between the U.S. and China will be reached in the early part of 2019 and that will have an enormously positive impact on the U.S. economy. Both the U.S. and China want to make a deal. The center of gravity for the markets is sentiment. As Henry Ford once said, “Whether you think you can or whether you think you can’t, you’re right.” How do you want your future to look? You will never have 100% of the facts and if you wait until you know everything the time/opportunity will have passed. Jane Wurwand, co-founder of Dermalogica, says that intuition is equally—or perhaps more—important than intellect when it comes to making decisions. Click the image below to watch her brief video. Based on my understanding of the local market in the greater Seattle-Bellevue area and global economic trends, I am confident 2019 will be another year of economic development, technological advancement, infrastructure improvement that will all benefit home price growth. I do not see a forthcoming decline in local economic activity. Even if none of the above happens, I’d rather buy something tangible and build equity than pay rent (CLICK THIS LINK FOR RENT VS. BUY COST ANALYSIS). I’m looking forward to buying a new home with my wife in the next few months, and also increasing the size and love of our family. Have a very healthy, happy and productive new year!